Ruane said the nation doesn’t need, or want, another temporary solution. “While any infrastructure package should be comprehensive, its foundation must be a permanent solution to the Highway Trust Fund revenue shortfall,” he said. “Look no further than the last five years, 26 states have demonstrated there are no political ramifications to increasing the gas tax,” he said. Other members of the panel assembled for the briefing included National Retail Federation President & CEO Matthew Shay, Association of American Railroads President & CEO Edward Hamberger, American Beverage Association President & CEO Susan Neely, U.S. Chamber of Commerce President & CEO Tom Donohue, and National Stone, Sand & Gravel Association President & CEO Michael Johnson. Hamberger reiterated the number one issue at stake is restoring the revenue stream of the trust fund. 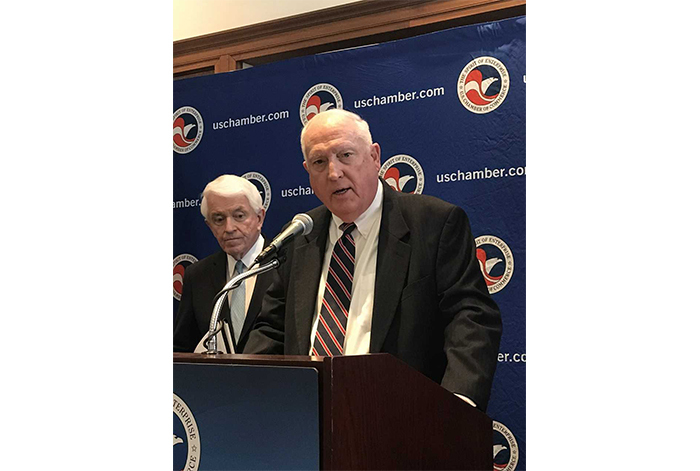 The Chamber’s four-part plan also calls for streamlining permitting, guaranteeing federal loan programs continue, and taking action to ensure there are enough trained workers. Many participants in the summit noted immigration reform could be a major issue for the transportation construction industry and its workforce, with thousands of legal workers classified as “TPS” or “DACA” faced with the possibility of deportation.